This temple has around 3 to 4 ft. tall Shri Nagar's statue and they have Abhishegam during Rahu Kalam. This temple has been in existence at this site (a rubber plantation), for more than a century. 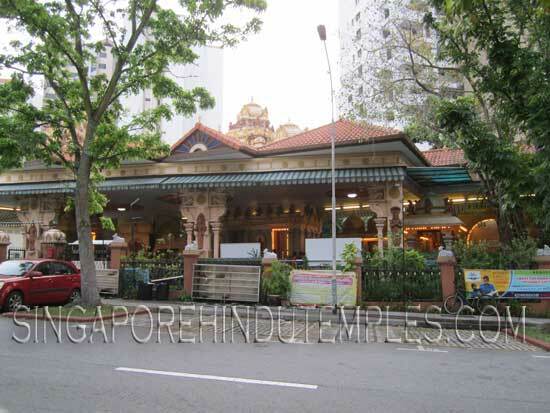 In 1990 a community of 30 Indian families living at Jalan Hwi Yoh erected a simple shrine. The shrine comprised of a flat semi-spherical granite stone with inscriptions & a trident placed under an unnamed tree. The stone is now entombed under the statue of Lord Muneeswaran in the present temple. The pipal (Bodhi) tree inside the temple was planted sometimes in 1929 & there were attempts by some to chop the tree down but they failed. In fact misfortune befell the perpetrators. Several villagers who claimed they saw visions of Lord Muneeswaran, then decided to erect a shrine in honour of Lord Muneeswaran. In 1969 the Hindus who maintained the temple made improvements & installed additional deities namely Ambal, Vinayagar, Murugan, Nagar & Bairavar. In 1980 with the help of Dr. Lau, MP, Serangoon Garden Constituency, the temple was granted a TOL back-dated to 1955. The temple was than officially registered with ROS in 1980. To keep abreast with the developments around the temple vicinity, in 1995 the Management Committee decided to purchase the land and erect a permanent structure (proper temple at the same site which is about 1500 sq. meters. With the assistance of the MP, the land was purchased from the government on a 30 years lease. With funds collected from our devotees, well-wishers, donors & through other various fund raising projects, the temple was constructed at a cost of $3.5M. The temple was consecrated on 11th June 2000. The most significant feature of this temple is that it is built at the original site around the "Bodhi Tree' thus retaining its historical roots & vibration. Unlike other temples our temple has a tiled roof & there is a basement with multi-purpose hall, classrooms, mini library, staff quarters, tiles, kitchen & etc. The main temple prayer hall is an open concept with only nine pillars, all on the sides. The number of sanctums is also nine. It has a 3-tier Raja Gopuram of good height, octagonal shaped 'vimanam' for Lord Muneeswaran, 36 gold plated tridents on the roof tiles & 2 glass towers. This gives the temple a majestic & magnificent look. It has a 4ft Nagar, one of the biggest in this part of Asia. There are 2 ramps, one to the basement & the other to the prayer hall, to serve the handicapped. From a humble shrine/wooden hut, it's transformed to a magnificent & prominent landmark in this part of Singapore. The temple caters to the religious & spiritual needs of the resident of Serangoon Garden, Serangoon North, Serangoon Central, Ang Mo Kio, Hougang, and Seletar Hills, Paya Lebar, Ponggol, Yio Chu Kang & others in the vicinity. It conducts a number of major pujas during the year & the congregation can reach up to about 600 to 800 devotees at any time. There is a chariot procession to the neighboring estates once a year. Besides religious activities the temple offers a wide range of other social, cultural, educational & welfare services. It is actually a center of many activities, so much so, that we are unable to hire the basement hall for any private functions as it is fully used for the activities. We conduct Tamil tuition (primary 1 to 6), vocal, dancing, musical instruments, yoga, chess and mandarin classes. As many as 400 to 500 participants take part in our activities during a week. We also provide legal & medical counseling. Every year we give away about $30,000 as bursary to needy primary & secondary student of all races. We also manage a kindergarten with 136 students at Blk 838, Yishun St 81.